Thank you very much, we've reached our goal of $3,000 for the private investigator. Our NEW goal, is to raise an additional $5,000 to put towards a reward and to help the Anderson family with any additional expenses. I dont know you, or Toni, but I am crying and praying for you and your family. I hope you get the answers you need. 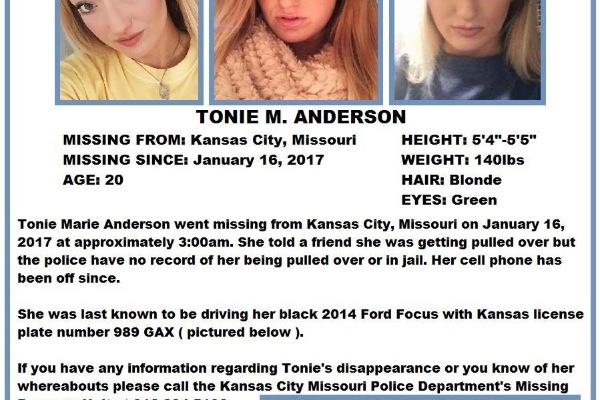 We extend our prayers and best wishes to the Anderson family, friends and searchers for Toni's safe and speedy return home. A small gift for all the significant reasons Toni is uniquely important. Praying for a homecoming. Or thoughts and prayers are with you . Brian and Liz, We continue to pray that God would move and bring clarity and comfort to your family today.